The pashmina is such a versatile fashion accessory that you have a variety of ways to wear a pashmina with a multitude of outfits. The pashmina craze that erupted in the mid 1990s led to this item being seen virtually everywhere. While the term "pashmina" refers primarily to the cashmere that is used to make this accessory, the name came to be so connected with wrap-style shawls that many people commonly refer to all types of shawls as pashminas. The reasons pashminas became so popular was the soft fabric--at first, as with many fashion trends, pashminas were high-end items. Gradually, the style trickled down to the masses and pashminas became available in a wide range of prices, although the ones made from the most quality materials are much more expensive. Belt style: When wearing a pashmina around your hips, keep in mind that you shouldn't do so to minimize your hips. Just as wearing a jacket tied around your hips calls attention to them, so will wearing a big pashmina. This should be a style alternative, not something to hide a body part you don't like. If your pashmina is very wide, fold it in half once and then bring it around your back and tie it once on the side. The tie should be casual and loose, but tight enough to keep the pashmina on your body. This is a good look for taller women and will look good with nice slacks or a shift dress. Shawl: You can carry your pashmina along for this look. If you suddenly feel chilly, drape your pashmina over your shoulders. You can either tie it in the front of you or use a shawl clip to keep it secure. Stole: Similar to the shawl style, wear your pashmina draped over your shoulders and across your front for an elegant evening look. Beaded pashminas work well for the stole style. Hollywood: This requires two pashminas; contrasting colors will up your style ante. After folding your pashminas two or three times lengthwise, loosely intertwine them and then drape around your neck. You can leave both ends hanging in front or back, or you can drape one end in front and the other in back. Grace Kelly style: If you're riding in a convertible and don't want your hair to blow all over the place, or if you just like a classic look with a mysterious vibe, try draping a pashmina over your head a la 1950s glamour style. 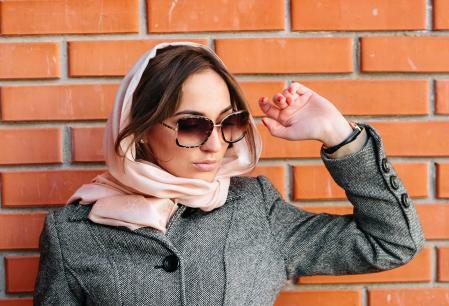 Leaving the front part of your hair exposed, place a pashmina over your head, holding the sides close to the sides of your head. Bring the pashmina ends under your chin and pull to the back of you. Tie in a knot; or you can tie in a knot on the side of your neck, allowing the ends to fall effortlessly and casually. Pair with an oversized pair of sunglasses for all-out glamour. Sash: Drape your pashmina over one shoulder and bring it down and across your body to the opposite hip. You can either knot your pashmina or use a shawl pin or clip to keep it secure. This is a fun, breezy style that can be worn over clothing or as a coverup at the beach. Reverse scarf: Fold your pashmina lengthwise until it's a scarf width you prefer. Instead of wearing it around the back of your neck and letting it fall in front, place the middle of it in front of your neck and allow the ends to fall behind you. Even when pashminas aren't all the rage in fashion, you should still feel comfortable pulling yours out to wear whenever you feel like it. Pashminas can be an elegant addition to many different outfits, for day or for night. One of the best ways to wear a pashmina, whatever style you choose, is with an attitude of effortless chic.